Have you ever wanted to see what you’d look like when you’re a senior citizen? Or maybe you want to check out what your hot current/potential girlfriend or boyfriend might look like when they’re 90 years old? Could you still find them attractive in their old age if the two of you settled down? Pivi & Co’s new Aging Booth app will give you the opportunity to see what that person might look like when they’re old and gray. Or it might help you re-consider that investment in 75 SPF sunblock and wrinkle cream. Pivi & Co designed a very simple and straightforward app for consumer use. Simply select a photo taken with your iPhone camera or pick from photos already located in your iPhone photo library. The program has face detection and will transform the face and adjust with auto-cropping features. Once the transformation is complete, you can see the before and after views by shaking your iPhone or iPod Touch. Save the picture of yourself to share with friends and family or hide it forever. You might even share the picture of the hottie your friend is dating (after the approximated aging effect) and tell them to ditch him or her. Don’t forget to save your picture if you want to send your results over e-mail, Facebook, and Twitter (via MMS). Use a picture of a person between the ages of 15 and 60 for the best results. 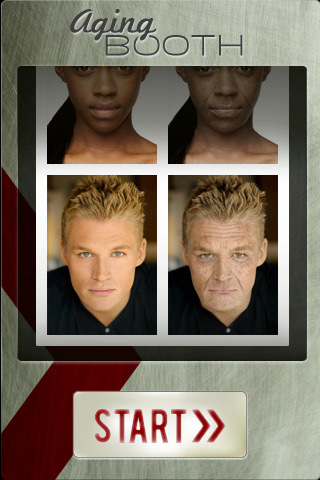 What’s nice about this app, is that if users need additional support, they can go to www.agingbooth.com. This is a fun little app and it fulfills its purpose and provides passing entertainment. The graphics are decent for a small app. However, the effects look the same on all people–baggy eyes, wrinkles, and age spots. Developers might consider adding a feature that shows balding or graying hair and thinning lips in future updates. For the $0.99, it’s a decent buy but that money is better spent elsewhere. AppSafari review of AgingBooth was written by Linda Ta on March 15th, 2010 and categorized under App Store, Fun, Health, Photos, Utilities. Page viewed 6919 times, 1 so far today. Need help on using these apps? Please read the Help Page. Awesome and so fun. works even on my mother.